FEB 15, 2009 – THE FILM EXECUTIVE STRIDES INTO THE ROOM. He notices Raghavan (Muthuraman) and apologises for making him wait. Beside the executive is Mr. Pattappa, the producer behind Latha Movies. At this introduction, Raghavan smiles. Hands are shaken with excessive courtesy. No one has paid any attention, yet, to the nondescript Sundaram (Nagesh), who stands by the side of Raghavan with a palpable sense of unease. No one notices that he folds his hands in a hesitant greeting, hoping that the introductions would come around his way too. No one notices that he follows them as they head across the room and seat themselves in chairs. And then Raghavan makes them notice. He points to Sundaram, who’s seated himself on the floor with a singularly graceful descent into cross-legged deference. As Raghavan introduces (his friend) Sundaram to the executive and to Pattappa, requesting that they consider him for a break in their movies, Sundaram greets his prospective benefactors. He raises just his backside off the floor – a posture midway between sitting and standing, executed with the effortlessness of a wiry acrobat – and plops back to his position. The executive commands Sundaram to rise. He does so in one smooth motion. The executive remembers something. He turns to Raghavan and enquires, “Isn’t this man a server?” Raghavan admits that he is, as Sundaram reminds us – as if he were in an exaggerated silent movie – what a deer’s face would resemble if a pair of headlights was suddenly switched on in its vicinity. But that isn’t an issue. The executive requests Sundaram to perform. Sundaram looks down and across the room, as if praying for inspiration from the carpet, or a chair, or a pair of feet perhaps. The executive asks him to at least demonstrate a few distinct styles of walking. Relief floods Sundaram’s voice. “I can walk, sir,” he says. He turns and heads away from his audience of three. And as a trumpet issues a long, sharp note that dissolves into a stretch of jazz – possibly the only music fluid enough to accommodate the on-the-spot improvisations to follow – Sundaram extends a leg, as if stepping over a largish puddle. He brings the other leg over so the knees knock, and in an instant, his walk has morphed into modern dance. For his next trick, Sundaram invokes Chaplin’s waddle. Then, emitting the cackle of a dreadfully ineffectual villain, he bends his torso backwards, as if that lean frame suddenly ballooned into an oversized paunch. “How’s the boy?” the film executive asks Pattappa, as Sundaram walks towards them. Before Pattappa can reply, Sundaram has begun to walk away, this time in mid-squat, his legs spread out at right angles to his body. Now he affects a shimmy, his upper half in sporadic spasms as his feet appear engaged in an attempt to scrape off chewing gum from the sole of a shoe. And finally, he’s all arms and legs, a discombobulated spider that’s dropped off a ceiling fan at full speed. The alarmed executive wipes his face with a handkerchief, when Sundaram pokes his shoulder and demands, “I’m asking you, dammit!” Raghavan rises from his chair and slaps his friend. He shoves Sundaram away and asks him to get out. And now, the tiniest of quivers creeps into Sundaram’s voice as he tearfully turns to his friend. He tells Raghavan that he wouldn’t have minded if the executive had similarly slapped him. “But instead, why did he have to humiliate me in public?” The executive has had enough. He orders the guard to boot Sundaram out. And extraordinarily, Sundaram switches from sentiment to slapstick. Extending a hand out as if it contained a switchblade, he threatens the executive, who plays along, his hands up in the air. Sundaram intimidates an onlooker into handing him a glass of water. He drains the liquid in one smooth motion and tosses the empty glass to the executive, who catches it in the manner of a magician’s trained apprentice. Sundaram, apparently liberated by the realisation that he’s lost his chance of making it in the movies (and therefore having nothing left to lose), advances towards Pattappa with a sinister snigger. Sundaram yanks the hapless producer out of his chair with a tug at his necktie. He positions Pattappa’s cheek alongside his own and begins to tango across the room. A few seconds later, he releases his victim and jumps on a sofa with a ta-dah flourish and lets loose a final cackle of liberated laughter, in as many demented variations as he demonstrated his walk earlier. Raghavan approaches his friend, evidently confused. Sundaram demands to know who he is. When Raghavan reveals his name, Sundaram does a double take and rattles off variations. “Are you Vijayaraghavan? Veeraraghavan? Srinivasaraghavan?” The prefix-free Raghavan walks to the executive and worries that Sundaram may have lost his mind, at which point Sundaram reveals that he was just fooling around, “acting.” Everyone is delighted. The executive whispers to an aide that if they book Sundaram now, they can get him cheap. Pattappa writes out a cheque for the princely sum of a thousand rupees and hands it over to Sundaram, as advance for his forthcoming production that will feature the newly minted actor. And at this point, as Pattappa announces, “I’ve decided to cast you in my next film,” Nagesh does his most exquisite routine yet. “Your next film?” he repeats, still unable to come to grips with his good fortune. But then he stiffens, noticing Pattappa’s shiny dome. Running a hand over a couple of invisible hairs, he observes, very dryly, “Have you made many films so far?” Audiences that grew up with Nagesh will cotton on to the slyness of this apparently ungrateful gesture as the most identifiably Nagesh-like among everything that’s transpired during these five minutes of Server Sundaram, but every other aspect – the easy laughter, the easy tears, the easy contortions of that easily flexible frame – was as indispensable a part of the great actor’s arsenal. He could do it all. He did it all. Copyright ©2009 The New Sunday Express. This article may not be reproduced in its entirety without permission. A link to this URL, instead, would be appreciated. Thank you for this verbatim description of those magical moments from ‘server sundaram’-the most ubiquitous moment of which is the one involving Sundaram’s first entry into the hotel(his misadventure with the coin). Nagesh was one of those who made the lead actors/supporting actors take a backseat with well-crafted and fabulously played roles. He and Cho are among my favourite yesteryear comedians. Not to forget the kind of songs he got to enact-he was the Mehmood of tamizh cinema, who could play serious roles as well as he played comic ones, though mostly known for his comic roles. The comparison with Mehmood assumes relevance when we notice that quite a few of the movies with Nagesh in them were remade in hindi with Mehmood playing the same role and vice-versa. Though I lovvvvved him doing comedy, my favorite movie with him remains ‘ethir neechal’-his ‘madipadi’ Madhu role was tailor-made only for him and it remains one of the cult-classics even today(its’ hindi remake ‘lakhon mein ek’ with Mehmood in the lead role, though a good movie lacked the KB touch). I did not particularly like his roles in the post 90s era(especially the ones with him in negative role like ‘apoorva sagotharargal)-perhaps I could digest someone as likable as him doing negative roles but even then he did ‘magalir mattum'(a dead corpse), ‘avvai shanmugi” and gem of a special appearance in ‘Vasoolraja MBBS’. Well… not a great piece. The epitome of that slyness can be seen in Vaithi from ThillAnA MohanambAL. It is the performance that sneaks through amidst Sivaji, BalayyA and Padmini. He gave the role something even Kothamangalam Subbu did not envision. That last para brought a smile. As you have said, it is but a slice of his genius. Thanks for this lovely piece on Nagesh. Brought that scene to life. Loved the last para. Ah Nagesh., what an artiste. He wasn’t born with the face of a hero but for me he was always more than a hero. The only equivalent i can think of is Manorama. I’m pretty sure the coin thing from Server Sundaram was lifted from a Chaplin film. Nagesh was truly one-of-a-kind. He was a master comedian, yet, he was also touching in more serious moments. His role as Tharumi in Thiruvilayadal is another classic, particularly his back-and-forth with Sivaji Ganesan. And I loved his chemistry with Balaiyya in films like Thillana Mohanambal and Kadhalikka Neramillai. Hari: I’m not a fan of Pattanathil, but yeah, “Soapu Seeppu Kannadi” is a fantastic film. I saw it in a theatre in Adyar called Eros, which is now an effing car dealership 🙂 By the way, I too am no fan of his “villainy” in Aboorva Sagotharargal. Something just wasn’t right about that comic-villain in the context of that film. I realise that Kamal intentionally wanted the killings and so on to have a touch of lightness, to balance out the bizarro Grand Guignol moments, but I thought the film would have been elevated with a really “serious” antagonist. What a brilliant piece to remember the wonderful actor by! How about his terrific performance in Nammavar that fetched him a national award, which was again mostly silent with terrific emotions. Indeed he could do it all. How about ‘ethir neechal’ and ‘navagraham’ his two gems with KB with him in the main lead-these, apart from Server Sundaram were a few which brought the serious actor in him out(but then in a KB movie, every character is so well-etched that it would be unfair to give credit to one actor)-your take on these? And yeah, forgot to mention ‘tenkinnam’-not a great movie but had its’ moments-like Nagesh doing a ‘roop-tera-mastana’ act(in his comic style), him dressed-up like a tiger(the make-up was quite lousy though) and P Vasu making reference to his dad’s ‘rathakanneer’. Then, how could I forget his special appearance in ‘thillu-mullu’-especially the tongue-in-cheek way he refers the actress as Nirmala Duraiswamy, not Sowcar Janaki!!!!! He was mostly doing side-roles in those Jaishankar, MGR, Muthuraman starrers but I loved him more in these, which had him in lead roles, of course there are many more memorable roles…..the names of movies I mentioned constituted just another ‘slice’ of his genius. Apologies, that was MRR Vasu in ‘thenkinnam’, not P Vasu and the supporting actor was Surlirajan, I guess(don’t remember). rangan: aha, Eros. God knows how many movies I saw there. It never use to show brand new movies. Always movies about 6/8 months old. Same with Jayanthi theater in Thiruvamayur. Since I use to visit Madras only in Holidays I had to ‘catch up’ movies I missed in the last 6-8 months. Eros, Jayanthi, Kabaali (mandaveli) were the ones rendering that service. And Jayanthi used to show two movies for the price of one. Have you seen those? Thinking back I actually saw few hindi movies also at Eros and Jayanthi. (missed the first time when it came). I still remember the atrocious pronunciation of the movie name by the ticket seller. Something like “yadom kee bhagaat”. I saw Don also in 1979 which somehow I had missed first time. Then there was Geeta mera naam at Jayanthi which I saw in 1978 something, some 4 yrs after its release. If I am not mistaken all the 3 theaters are no more. KB confessed that he wrote the entire script with nagesh in mind and nagesh alone. It shows through the entire film and a word of praise is not enough for the great muththuraman who agreed to do a role that in terms of histrionics doesn’t hold a candle to the hurricane that Nagesh swirls up in the screen. 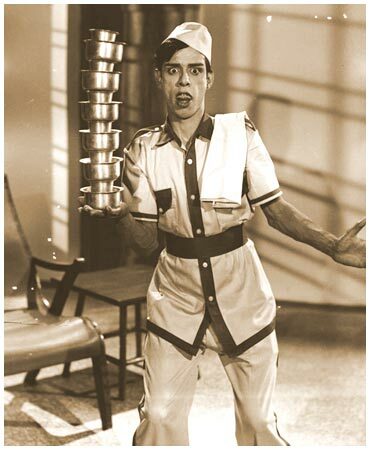 Yet his dignified and restrained performance opposite the talent of Nagesh held up the movie brilliantly. It is not the demise of Nagesh that bothers me – it is a loss of entire generation of actors, a Balaiah, Sivaji, chandrababu, muththuraman, Karunanidhi, MRRadha – set of actors who vied with each other at the same time respecting the greatness of their peers, made themselves look funny and reduced to give space to another co-talent of theirs with grace. This entire generation of fabulous actors who valued acting more than anything else have now been replaced with ‘stars’ and ‘pseudo stars’ who cringe at space allotted to a real talent and thereby deprive the audience of watching a symphony of pure talent that was so visible and thrilling in the fifties and sixties. As far as Nagesh goes, I had written a piece in PFC about him after his demise, I am still unable to pull myself out of the loss – the guy was a wicked genius who never got his full due from the folks he entertained. It is sad that we did not have a Vegas or Broadway to showcase and reward his talent to the fullest. In Server sundaram alone he could span the NSK style of dialog comedy, the thangavelu style of witty one liners and comebacks to chaplinesque 5 paise scene to pure melodrama and he could do the alternation in just one shot – Genius is one word that looks so short to explain the real genius – a pure acting force called Nagesh – even million tributes for him will fall short of eulogizing his talent and what he gave all of us. one more occasion where a hindu belief in rebirth doesnt sound so irrational. I’m Rajesawar k, writer of films like Aval Appadithan, Panneer pushpangal, Ezhavadhu manithan, Meendum oru kadhal kadhai, Kadalora kavithaigal, Jeeva, Vetri vizha, Seevalaperi Pandi and Directed Nyaya tharasu, Idhaya thamarai, Amaran, Kovilpatti veeralatchumi- and currently making Indira vizha. I’m a regular reader of your columns in Express and I’ve always found them intelligent, poignant and incisive. Your regard for masters and masterpieces-in any language- and chastisement when warranted had always amazed me. Your recent piece on Nagesh though good, could have been better with your great understanding of his art. What can I say about your observation on Naan Kadavul- a film neither understands the spiritual realm nor social issues, a confused muddle of subnormal intellect and an extension of Dravidian drama of which we-Tamil film makers- are all practitioners. In the Temple of mediocrity fight is on for the post of high priest! I still remember your review of Delhi Heights- a gem – catharsis for a sane innocent film goer who unwittingly bludgeoned. I’ve attached the presentation that I made in the All India Screenplay Writers’ Conference held couple of years ago in Pune Film Institute – thought you may be interested in reading. Tambi Dude: Jayanthi too is gone? I remember watching something like Jay Jay last there. But even that seems to be some 4 yrs back. BR: K Rajeswar wrote all these films?! Among all, AA and PP? That’s really shocking. I’m just ashamed at my ignorance. I know only of the Rajeswar post Idhaya Thaamarai. Now I’ll start searching for the Veeraltchumi dvd. btw, I remember vaguely reading Delhi heights, and would like to have a relook. Wasn’t it in the easyjournal blog? Wasnt Rajeshwar associated with Gramathu Adhyayam as well or was it just the director of Aval Appadithan (whose name I have forgotten)? Jai, you have mentioned Sivaji, C.Babu, Nagesh, MRR, MuthuR, and Karunanidhi as a generation of lost actors with the humility to subject themsleves to the script. Of these, where does Karunanidhi figure? I presume you mean A Karunanidhi rather than M but still, I cant remember much performances from AK that stand out any better than, say, an Ennathe Kannaiah or Aiya Theriyadhaiya Ramarao. Maybe, you have seen some movies which I am unaware of. kiruba, I think Rajeshwar called himself Somasundareshwar in Aval Appadi than so you have excuse for not knowing. As for Veeralatchumi, all I can do is to warn you not to search for the DVD – velila pora onaanai…. I don’t think K. Rajeshwar was involved in the making of grAmaththu aththiyAyam. I think Rudraiah wrote the film himself (I mean, didn’t collaborate with any other writer), but can’t be sure. That factoid was quite well advertised post Amaran’s success and in pre-release publicity for Idhaya Thaamarai. What happened to Rurdiah, thats a bigger question, though? A.Karunanidhi wasa gem of a comic actor who gave support for many comic geniuses to paint their flourishes. Like Saarangapaani – no comic scene could be complete without the reactions to the ‘improvisations’. here is the blgspot of TRR’s granddaughter..
raj: Call me a fanboy or whatever..I loved the score of Sendhooram..may be you should have said Dhanam! Another theatre was Blue diamond (Part of Sapphire and it was advertised as a Veecumsee theatre – till date I do not know the meaning) where you paid for one show and could spend the rest of the day watching all the remaining shows! raj: was just kidding abt the dvd. I’ve actually caught some glimpses of Veeraltchumi on Vijay, it comes at least twice a month on it. And sendhooram is something I’ve liked too, esply for the aalamaram melamarum song.